South America 2012: Lake Cuicocha day trek. For the past two days our guides have been 3 indigenous Qichua - see photo below. 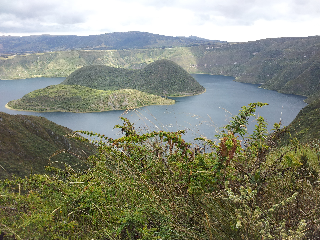 Today we trekked at 3700mts around Lake Cuicocha. The lake is ~250mts deep and is situated in an active volcano. The steam vent could be seen between the 2 islands. The lake is sacred to the local indigenous people and rituals and ceremonies are performed at certain times of the year to appease the gods of the volcano. We learnt a lot about the local medicinal plants, and saw many species of orchids, and a spectacular array of colourful flowers. We also learnt about the local animals. Off to Condor trek tomorrow for 4 days of overnight trekking in the Cotopaxi national park.